Think about the last time when you treated yourself to a top luxury hotel stay. The feeling of sleeping in between freshly-laundered white sheets, a soft mattress and resting your head into the piles of the soft pillows. Have you started missing that already? Well, what if we tell you that every day you can sleep like the way you do in a luxurious hotel. Sounds astonishing, right? Let’s check out how? So, now it’s time to up your pillow count. There’s no better feeling then drowning yourself in the bed with big, feathery pillows surrounding you. Adding 4-5 pillows on a queen or king-sized bed can help you achieve that cozy and comfortable look. You can even reserve 2 pillows to stand up against the bed frame. The kind of pillows you choose depends on the way you sleep. People sleeping on their back needs a medium-firm pillow while side sleepers need one firm pillow and one soft top pillow combo to fill the gap between their shoulder and neck. People who sleep on their fronts need a soft pillow to reduce neck strains. 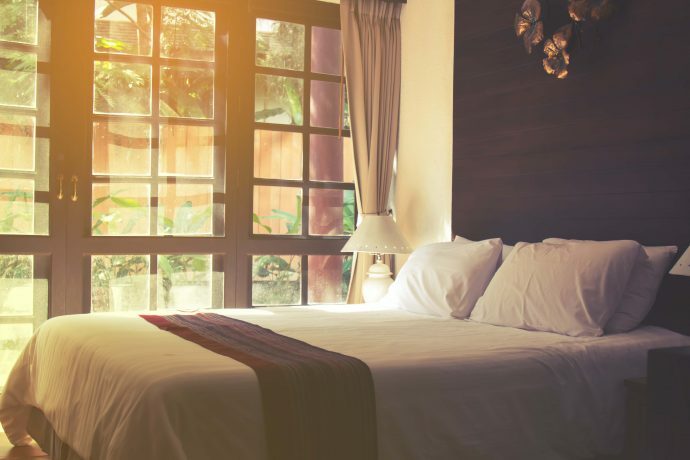 From spotless white sheets to the all-white duvet, all high-end hotels make their bed using white linen. White linen creates a focal point for your room that’s almost spa-like and meditative. Plus, white linens can easily be bleached. Just make certain that the rest of your room isn’t too cold or stark. Warm colours can keep the place luxe and cosy. We spend one-third of our lives on the bed. Thus, it’s worth investing in a quality mattress for sound sleep. Most of the top-end hotels use mattresses made from CertiPUR-US Foam. It helps in getting a comfortable and sound sleep. Experts revealed that the most preferred mattresses are the one that enables you to lie in a neutral position. This allows your spine to follow its natural curvature. If you’ve had your mattress for more than 7 years, it’s likely you need to consider buying one of the best mattresses in India. If you felt that your hotel bed is too soft and you never feel like getting up from that bed, there might be a chance that the hotel has added a mattress topper. It is a kind of mini-mattress that adds an extra layer of padding and support. Treat yourself to the comfiest sleep ever. Trust me, toppers are the game changer. Hotels take their bed-making very seriously. You should always wash your sheets separately and also consider ironing them. To get that perfect finish, use a flat white sheet and sharp hospital corner that ensures that your bed looks flat and neat while everything is held tightly in place, even in the night. Why reserve that luxury sleep only when you book a 5-star hotel? Sleep is so precious! You deserve to have a good sleep every night in your bed.